Something's Wrong / Thought As Much / What Does Anybody Ever Think About. 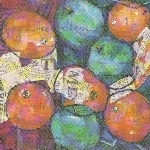 Apples And Oranges (The International Hope Campaign) (Archer/Saleh/Bache) A western-swing style festival of flutes and fiddles, released as the band's second single and intended as the title track of their album. 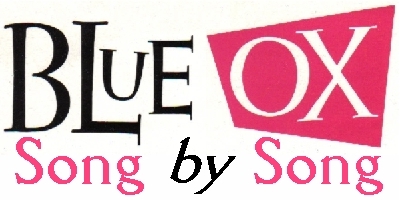 The song dates back to one of the Blue Ox Babes' early demo tapes and was co-writen by guitarist Nick Bache who was with the group briefly in its early days. As with many Blue Ox Babes songs, the lyrics are allegorical and a little difficult to decipher: 'What's up down on the ground, a close meeting. Someone from above shouts "take-a-this-up". The 12" version of the single included an extended play-out, alternating between a series of lively folk-influenced riffs. 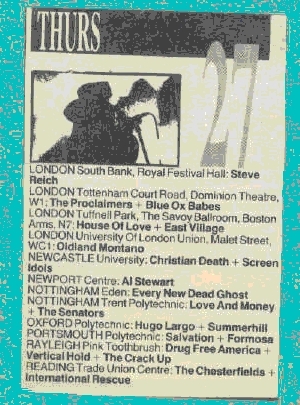 In a typical act of shoddy journalism, one ill-informed reviewer wrote of the single: "Still worshiping Dexy's, the hopelessly worthy B.O.B's have subtitled this 'The International Hope Campaign'. Suitable for the Eurovision." - Record Mirror. Ballad Of The Blue Ox Babes (Archer/Saleh) A mid-tempo ballad with a beautiful fiddle-led intro which was the closing track of the Blue Ox Babes' album. 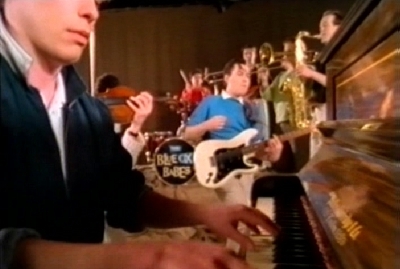 The autobiographical lyrics, telling "the story of the Blue Ox Babes; (three men and girl, approaching something final, no discouragement)", deal with the group's "trials and tribulations" during the long years ("spent crafting these trusty tunes") which it took the group to secure a recording contract. As Yasmin later explained: "Archer told it like it was. Steve was always living above his needs. Me, yes I did sigh and still do til this day. I sigh when I'm bored, I sigh when I'm frustrated and I sigh when I cry. I just sigh." Bedlam (Archer) An atmospheric ballad with plaintive fiddle, sultry trombone and more than a hint of Al Green's "Tired of Being Alone" on the chorus when Kevin sings "Don't forsake yourself no more, there's much more to you this day, I see nothing to deliver us from bedlam". Four Golden Tongues Talk (Archer/Bache) A really wonderful waltz-time ballad with beautiful harmonies, that features Andy Leek playing harmonium and includes the great lines: "Standards are solid, moral not squalid, so look me in the eye, friend, when you're telling your tale, for the truth is a stranger." This track dates back to the group's second set of demos recorded in early '82. Not credited at the time of its eventual release, Nick Bache remembers coming up with the initial idea for this song. 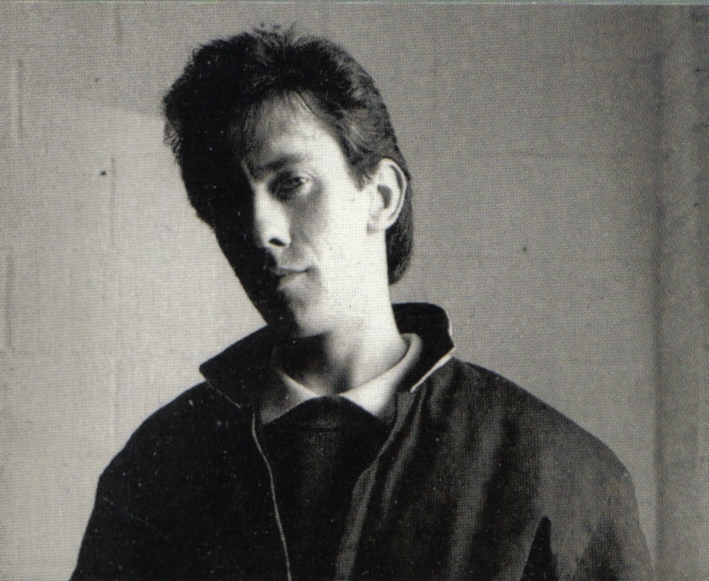 Gregory Right (Archer/Shaw/Wynne) One of the many hi-lights of The Blue Ox Babes' album, the only public airing of this tune prior to the CD release was a short extract of the 1985 demo [below] featured on the BBC's "Young Guns" documentary about the Dexys story. A joyously infectious gypsy-style romp, the lyrics are both obscure and alluring: "I thought about it but I didn't buy it, catholic (he was a catholic), I tried so hard not to deny it, but you never know about these kinds of things, it's just the way it goes." It Could Have Been Love (Archer) Perhaps the most pop-oriented Blue Ox Babes track, both in terms of sound and lyrical content ('Those were the times, when I thought love was being together, and those were the times part of me said you were forever'). The gorgeous tones of Yasmin Saleh are more to the fore on this track than on any other with some solo singing on the middle-eight in addition to the usual harmony vocals, and had The Blue Ox Babes been as successful as they deserved to be this would have made an excellent single - indeed there is even a 3.45 minute "single length" edit amongst the archives! I Get The Sweetest Feeling (McCoy/Evelyn) Nick Bache recalls: "We were really starting to sound tight and needing a little more to get our teeth into. We were all soaked in the sound of soul, what with James Brown and Al Green, etc. As a warm up song, to get the fingers working on the strings and the vocal chords loosened, we used to start off by playing 'Sweetest Feeling' by Jackie Wilson at every rehearsal. This proved to be a great 'get us in the mood' tune to play and warm up with." So it seems that while Kevin Rowland was singing about what "Jackie Wilson Said", Kevin Archer was actually singing what Jackie Wilson sang! Sadly this was never recorded. The Last Detail (Archer/Saleh) A brilliantly brassy instrumental with shades of Archer's Dexys classic, "The Teams That Meet In Caffs". Sharing its title with an early Jack Nicholson film, like 'Teams' it has the feel of a movie theme - bold and brazen - like a gang marching into town. One of the track's hi-lights, a trombone solo (performed by Big Jimmy Paterson) gives way to some unmistakably 'Archer-esque' brass riffs before returning triumphantly to the main theme and stomping off stridently into the sunset. Pray Lucky (Archer) Opening with a typically melodic burst of brass and fiddle, the lyrics to this 'Apples And Oranges' 7" b-side are remarkably scathing, with lines like: "Fool to believe you're winning, it's just not a part of you, soon you'll belie your lying and there's no taking part any more. You told me something I can say, your dawning day has reached a peak, your weak smile really shows your age, your time has come for getting (...no I don't really feel the need anymore.)" One can only speculate as to the song's subject! Russia In Winter (Archer/Shaw) Another glorious Kevin Archer instrumental, but unlike 'The Last Detail' the mood of this piece is (in keeping with its title) calm and reflective. An incredible eight and a half minutes long, its beauty lies in its gentle nuances. The subtlety and sensitivity of the interplay between guitar, fiddle and piano (performed by Vince Crane) are reminiscent of 'Don't Stand Me Down's more delicate moments, and the sedate pace and home-spun feel of the recording really do conjure up images of vast rural expanses. She's So Strong (Archer) Another powerful album track which opens with gentle piano and the softly-sung lines: "With the wonders of the world, and thinking about what to do about the boy meets girl situation, and it comes to us all, each and every one of us, if there really is a pure motivation" before the rest of the band kicks in as Kevin Archer declares: "She's so strong, stronger than I am". Curiously, the bass-line is almost identical to that used on Kevin Rowland's 1988 single "Tonight"! Something's Wrong (Archer) Original 1981 version of the song which eventually became "Walking On The Line", featuring Helen "O'Hara" Bevington on violin. 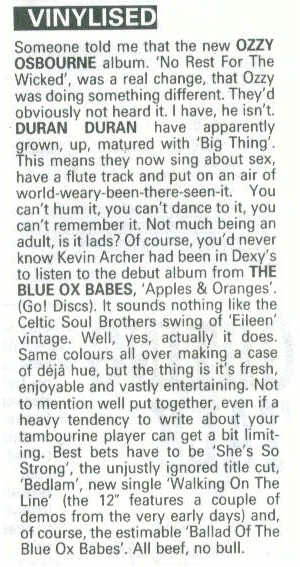 Clearly the key track from the original demo tape - and the one with the greatest potential for single release - Kevin Archer's appreciation of Marc Bolan is more audible here than on any of the other Blue Ox Babes' records. The influence that this recording, in turn, had on Dexys Midnight Runners' "Celtic Soul" sound is quite clear from the short mix featured below. "Something's Wrong (From The Start)"
Take Me To The River (Green/Hodges) A rousing cover version of the Al Green classic demonstrating once again Kevin Archer's ability to rework classic Soul standards into something original and personal. Interestingly, The Blue Ox Babes' version lacks the familiar "and wash me down" lyric in the chorus, preferring instead to let the instruments do the talking. 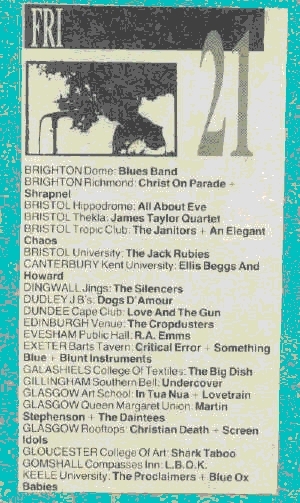 There's No Deceiving You (Archer/Shaw) The group's debut single, its lack of chart success was the first indication that The Blue Ox Babes brilliance was to go unnoticed by the general public. 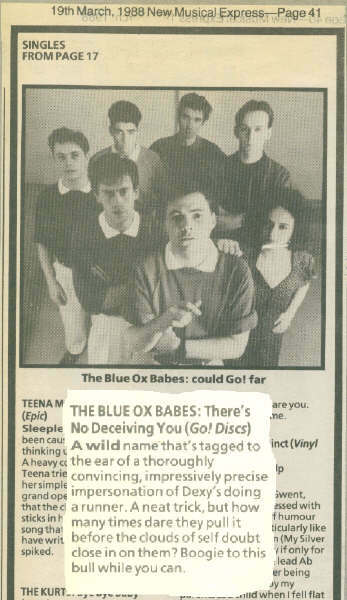 Issued at the same time as Kevin Rowland's debut solo single, 'WalkAway', Rowland commented in an interview that the Blue Ox Babes' release sounded "very Geno", adding that it wouldn't occur to him to make music that sounded like this any more (a comment which must surely have disappoined many Dexys fans at the time!) 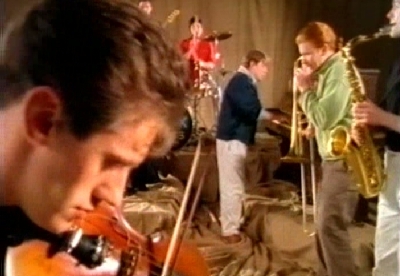 Whilst there definitely are shades of 'Geno' in the foot-stomping rhythm, packed full of hook-lines and catchy riffs, ‘There’s No Deceiving You’ is a great example of Archer's unique gift as a writer and arranger, expanding upon Steve Shaw’s original idea. Thought As Much (Archer) A folk-rock styled waltz existing in two different versions: one featuring the full band (that was due for release on the album in 1988) and another, featuring minimal instrumentation which is a demo version recorded back in 1981 (which was included as a b-side to "Walking On The Line"). 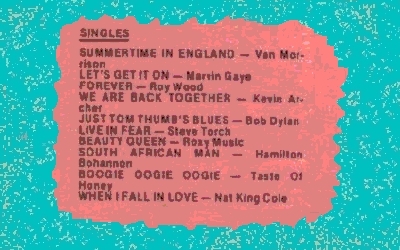 The song opens with a harmonica (played on the album version by Mark Feltham who later performed on Kevin Rowland's "My Beauty") in a style reminiscent of the "Midnight Cowboy" theme, before Kevin Archer launches into a vocal that rivals "Keep It - Part Two" in terms of unashamed, unrestrained emotion: "I've looked so hard, eyes have gone dry now, shoulders so brittle from this low". Walking On The Line (Archer) The Blue Ox Babes' third and final single and an extremely commercial release which inexplicably failed to sell - even to fans of the group. 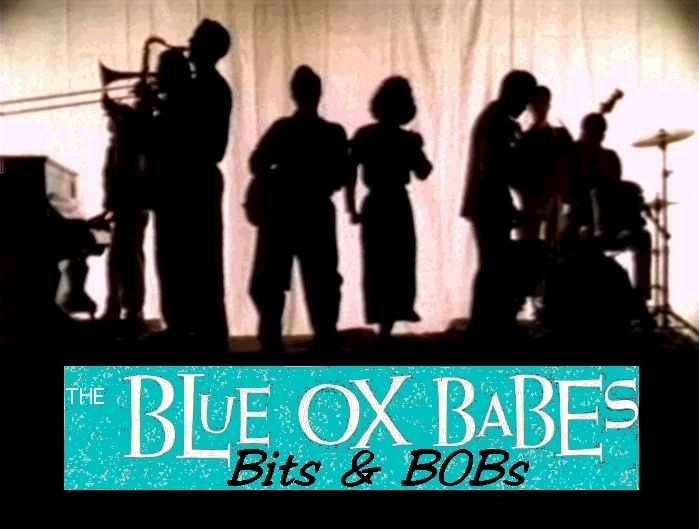 Indeed publicity surrounding its release was so non-existent, there is a misaprehension amongst many fans that The Blue Ox Babes only ever released two singles. Hook-laiden with brass, fiddle and a great "ba-da-dow ba-da-daa" sing-along chorus, this is as good as any of Kevin Archer's Dexys compositions and it is interesting to speculate how the song would have fared had it been released by Dexys in their prime rather than by the relatively unknown Blue Ox Babes. "It makes me want to feel so strong". We Are But Together (Archer) In August 1981, Kevin Rowland included "We Are Back Together - Kevin Archer" in a list of his ten favourite singles featured in Record Mirror. Something of a mystery, Kevin Archer remembers that he did record a song called "We Are But Together" before the group secured a deal with Go! Discs but it would seem that no recordings still survive. 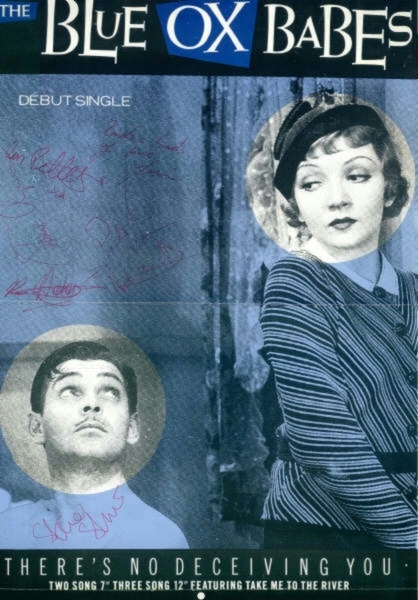 Nick Bache also recalls working on a song of this title in the group's earliest days: "I think it was no more than an exercise song, testing ideas out now Kev had left Dexys. In my time it never saw light of day again." Where Do We Go From Here? (Archer/Shaw) "La-La-La-La Means I Love You" sings some-time Northern Soul fan Kevin Archer with a sly reference to The Delfonics' 1971 hit. Faced with no real prospect of an acceptable deal, perhaps the title of this previously unissued demo was autobiographical. Although the song has remained unheard for twenty-four years, its lyric seems as relevant today as ever when Archer states: "no reason to get excited about the times we live in now." 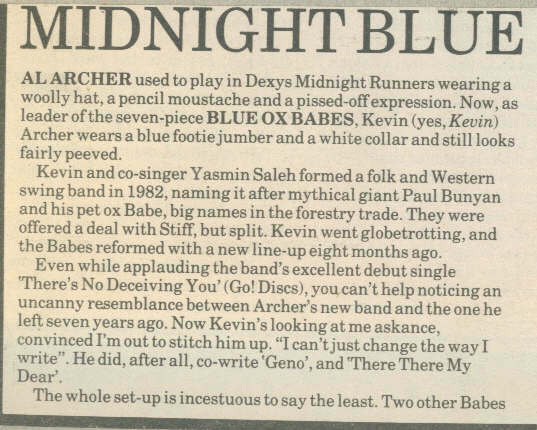 In an interview with Joanne Malin on her BBC West Midlands radio show in 2009, Kevin Archer talks about his experiences with Dexys and his excitement at the imminent release of The Blue Ox Babes' long-lost album "Apples & Oranges". It was the summer of 1988. 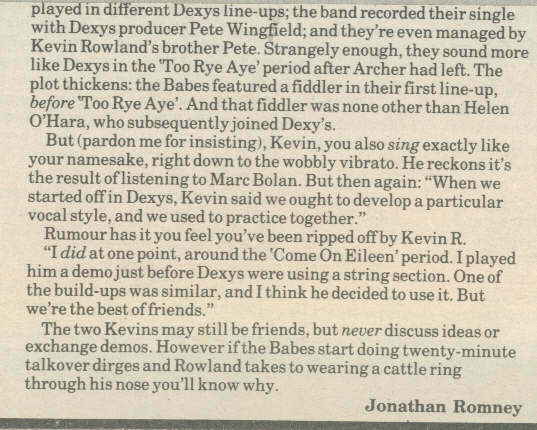 The previous couple of years had been a barren spell for lovers of good music, but I had been thrilled to discover that Kevin Rowland was bringing out an album, having loved his previous three albums with Dexys. In all honesty I experienced a sense of anti-climax when I finally heard the new material - it didn't "sound" right to my ears. How could Kevin Rowland, the man who had sung about purity, make a record using drum machines and sampled pianos? I listened to the album enough to realise that there were some good songs hidden beneath the unsympathetic treatment, but I never really overcame my sense of disappointment that a man who had made such extraordinary music could make such an ordinary sounding record. But then my brother, who worked in a record shop at the time, gave me a very exciting piece of information: there was another single out by somebody who used to be in Dexys. He couldn't remember who. It didn't matter to me - I was at my local Our Price first thing the next morning to find out for myself, but I got a surprise when I picked up the sleeve of the Blue Ox Babes single. Kevin Archer? No, that wasn't right. His name was "Al" surely. None-the-less it was unmistakably the same man who used to be in Dexys. The same man who had written "The Teams That Meet In Caffs" which had been my favourite piece of music ever, for the previous eight years. It was a personal anthem to me. I played it when I was depressed and it lifted me up, I played it when I was feeling good and it made me feel even better. It helped me to walk down the road with my head held high, staring the world in the face. As I studied the single in closer detail on the way home I began to notice other things that intrigued me. Steve Wynne. He was in Dexys too. 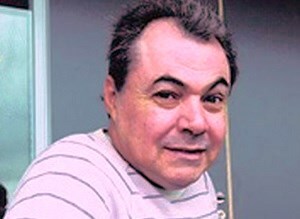 And there was a photo of somebody called Steve Shaw who looked very familiar. To my eyes it looked very much like Steve Brennan who, as part of the Emerald Express, had been at the heart of Dexys 'Celtic Soul' sound. And then I remembered the sleeve notes to an old Dexys single that claimed Steve Brennan was related to George Bernard Shaw. Suddenly it all fitted together - and suddenly I realised that there was a very strong chance I was going to love this record. From the opening bass notes of "There's No Deceiving You" I knew my sense of excitement was not in vain. This sounded how music SHOULD sound. It was bold. It was brassy. It was Pure. The vocals were unmistakably "Al" Archer - I had listened to his singing on "One Way Love" so many times, there was no doubt. And so I turned the record over and listened to the first of the two b-sides. A piano introduction gave way to some strident horns and strings and I waited for the singing to start. As a second piece of music came in and there were still no words, a glorious realisation came over me that caused a shiver to run down my spine. This was a new instrumental from the man who had written my favourite ever instrumental. I sat back to enjoy the rest of the music almost disbelievingly. This was exactly what I wanted it to be. As the trombone solo led into more unmistakably Dexys-style brass, something quite unexpected happened. My eyes began to well up. Before I knew it there were tears rolling down my cheeks. He was back. The man whose music had moved me so many times before was back. And he wasn't afraid to make brilliant music - even in this age of soul-less soul and acid house. 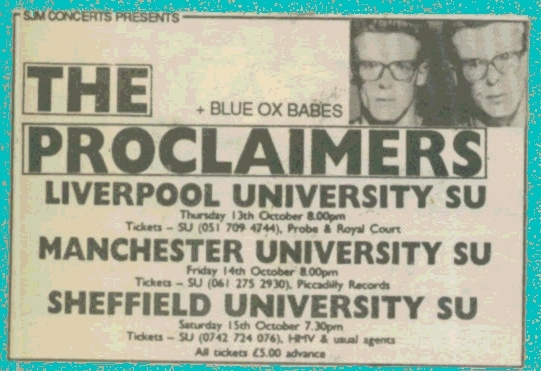 A few months later I discovered that my favourite new band were performing at a freshers' ball in a North London college. Such was my enthusiasm to see them I arrived at the venue about two hours too early, but was at least able to confirm that the Blue Ox Babes were indeed playing there that evening before walking the streets of North London impatiently. After a while I got back to the college and was still the first person to arrive for the evening's entertainment, but I decided to make the most of the student bar while I waited for the show to start. Eventually the moment came. I was allowed into the main hall and headed straight to the front of the stage surrounded by a crowd of students. As I waited for the band to appear I felt a hand on my shoulder. "Excuse me, please" said a voice from behind me as I turned around in amazement to see Steve Shaw squeezing past me to climb up on the stage. The music started and again I wasn't disappointed. The line-up was the same as on my single sleeve so I was able to recognise each of the group from their photos, although I remember Yasmin looking even more attractive in real life than she had in her picture. 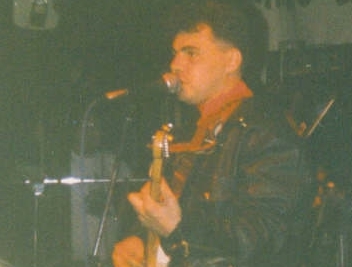 Kevin Archer (I was gradually learning not to think of him as "Al") looked great in a black leather jacket and sang with the same attitude that had made his Dexys performances so striking. After one particular song ended, Kevin looked at Yasmin and between them they introduced the next song... "There's no... there's no deceiving... there's no deceiving YOU". Realising I was about to see my favourite recent single performed before my very eyes, I let out a hearty yell of approval. It was at this point that I realised I was the only person in the hall who had actually heard of The Blue Ox Babes. The rest of the audience, who by now had all turned around to stare at me, were clearly students attending a freshers ball to whom the name meant absolutely nothing. What could I say? I shrugged my shoulders and waited for the familiar bass intro to drown out the deafening sound of my embarassment. The saxophonist, Nick Smith gave me an appreciative nod. Kevin Archer gave me a quizical glare. Thankfully the band gave a great performance of "There's No Deceiving You" and my little outburst was soon forgotten by everybody (I hope!) The rest of the show included many hi-lights: a sing-along rendition of "Apples And Oranges" with the entire audience shouting "Yeah" in unison, on the call and response sections; a great song called "Ballad Of The Blue Ox Babes" which I would not hear again for another thirteen years; and a sneak preview of the 'forthcoming single', "Walking On The Line" which I loved instantly and eventually hounded my local Our Price into ordering for me. Several songs had been introduced as being "from the new album" - I waited patiently for news of the release. It never came. In the, end of course, justice was not done and The Blue Ox Babes never achieved the fame and glory they so richly deserved. But for a few months in 1988, they were the best thing in my world and I'll never forget those days. Sometimes life takes some unexpected turns. 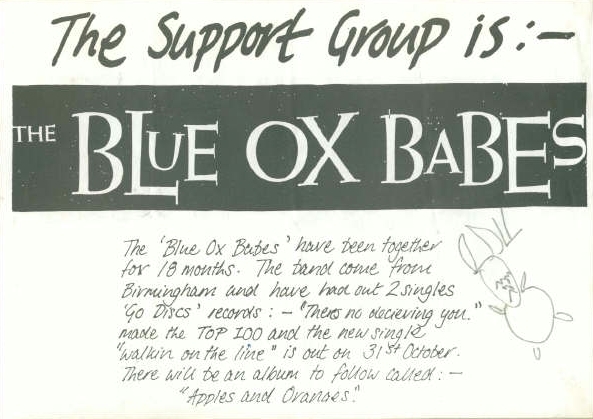 Back in 1988 when I watched the Blue Ox Babes perform on stage in north London it never occurred to me that many years later I would end up writing about them on pages that people could read using their personal computers. Even in 2003 when I wrote the above account - and created the very first version of these web-pages - I never realised that it would lead (inadvertantly) to such an unlikely sequence of events. Having been in contact with Yasmin for a couple of years and having learned more about the story of the Blue Ox Babes than I'd ever imagined possible, I was a little taken aback when in 2005 she informed me that Kevin Archer had also viewed the web-pages I'd written and wanted to get in touch with me. Needless to say I confirmed that I didn't mind him giving me a call and before I knew it there I was on the phone to someone who had been a boy-hood musical hero of mine. A natural question occurred to me: was he still interested in trying to get the Blue Ox Babes album released? In typically self-effacing manner he didn't seem to think anyone would be interested now. I assured him that I knew a lot of people who would be interested and found myself asking (rather improbably) whether he would let me make some enquiries on his behalf. Common sense told me that this was way beyond my experience or capabilities but 'common sense' is something I've never had in abundance so I decided there was no harm in putting out a few feelers. As luck would have it, one of the people I made contact with was an Italian called Flavio who I knew had some involvement with record companies. His immediate response was that I should talk to John Reed at Sanctuary Records who he had dealt with in the past and whose contact details he kindly passed on to me. Even though I believed in the Blue Ox Babes' music I didn't know if I really believed in the music industry's ability to appreciate great music so I was genuinely surprised when I got a reply from John Reed saying that he had heard about the Blue Ox Babes and that it was something which would definitely be of interest to Sanctuary. For a few months it all seemed very 'real' and I was optimistic that the album would indeed come out on Sanctuary. 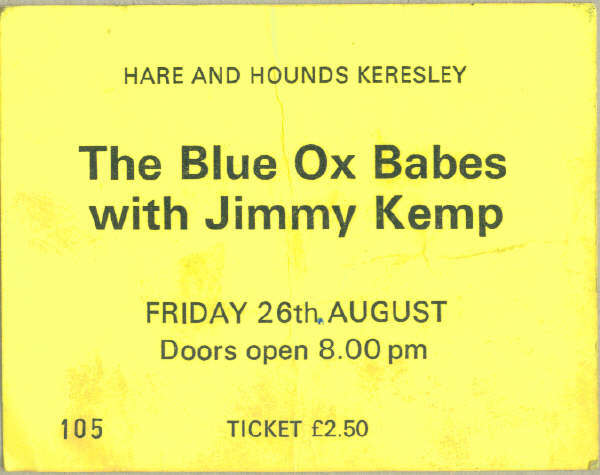 I even got as far as compiling copious notes about the history of the Blue Ox Babes with the help of Kevin, Yasmin and Andy Leek for the anticipated CD sleeve-notes. As it turned out though, fate wasn't quite so kind and the project got derailed by wranglings over ownership of the rights to the recordings, etc. I should have known that getting an album released couldn't be that easy! Time passed and I heard the rumours that the album was again scheduled for release - this time on Cherry Red Records - and, burdened by the cynicism of previous experience, I questioned if it could really happen this time. And then a couple of months ago I got an email from the man in charge of the latest project - none other than John Reed, formerly of Sanctuary Records! I now know that it really is going to happen. The Blue Ox Babes album really will get the release it has deserved for so long. And I realise how extremely lucky I got when I contacted Flavio back in 2005 and he suggested that John Reed might be the man for the job. I really couldn't have imagined any of this happening during those glorious few months in 1988 when the Blue Ox Babes were (as they are once more) the best thing in my world. The Italians probably have a word for it.